Our Southern Style: Go Wild With OppoSuits! OppoSuits - Worn To Be Wild! Our suits represent those who don’t take themselves too seriously but still want to maintain a sense of style. Levi loves clothes almost as much as his teenage sister! I never thought I'd have a boy that loved to be in style, but Levi gets so excited for new clothes! At age 5 he'll ask for "new outfits" when we tell him to give us ideas for birthdays and Christmas. When I heard about OppoSuits and went online to check out their options, I came across the Boys Badaboom Suit and knew that was the perfect one for Levi. More than anything this suit has to offer, I most love the way Levi's OppoSuit reflects his fun-loving, crazy, high energy, super-hero personality. For a Mom, watching your kids be who they were born to be is priceless and OppoSuits undoubtedly brings out kids confidence celebrate who they are. Badaboom badabeng. Kids only use tablets and phones these days but we at OppoSuits know that comic books will never run out of fashion. Even the littles of kids will want to wear this cool comic book patterned suit. Holy Poppin' Suit and Tie Batman! There's no doubt this boys suit is sure to turn heads and capture all of the attention in the room. Can I first talk about the bright bold colors that stand out against the black suit? Levi is always full of energy so it's never really too hard to know exactly where he is. The Badaboom suit itself just oozes color, excitement and attention. Everytime Levi wears his suit, whether to church, or when he begs to just wear it to the grocery store, he's never short on compliments and for kids, that's such a great way to build up their spirits. The boys Badaboom suit is a 3-Piece suit which comes with dress pants, tie, and jacket. The tie is a clip-on which is perfect for little boys to snap on or take off if they want to go casual. The jacket has a purple lining (complete with an inside pocked) and small shoulder pads to help it keep its sharp form. It's also accented with three buttons on the cuff, and two large front pockets. The pants, with two pockets of their own, are easily adjustable with an elastic band/button that allows your child to grow with their suit. OppoSuits took the time to sew the elastic to the waistband of the pants which means you don't have to worry about the elastic working its way out of the pants in the wash. That's right! I said wash!! I didn't want to give it away so soon but the entire suit is machine washable!! Gentle cycle of course, but every parent's dream is to have quality kids clothes that don't have to be dropped off at the dry cleaners! OppoSuit has a chart on their website to help you figure out the perfect size for your boy. Levi was in the middle of the 4Y and 6Y size so I went with the bigger 6Y and I couldn't be happier. I do have to take the elastic in on the pants almost all the way, but he doesn't mind it and because of the dark colors, busy pattern, and longer jacket, it's almost impossible to see the synch in the back. The jacket just fits him which makes me happy to know he'll get to wear it and enjoy it for quite some time. All of the pieces, including the liners, are made 0f 100% Polyester. The sewing has been done impeccably! I've not noticed any stitches popping out and every seam and hemline has stood securely through all of Levi's suit-wearing-adventures. I just can't say enough at how surprised I am at the overall quality of this suit. I paired the suit with some gray/black skater shoes and a white button-up shirt. This suit would also look great with a solid-colored T-shirt where your superhero can forego the tie for a more casual and relaxed vibe. As you can tell, Levi and I had a blast sharing this suit with ya'll! 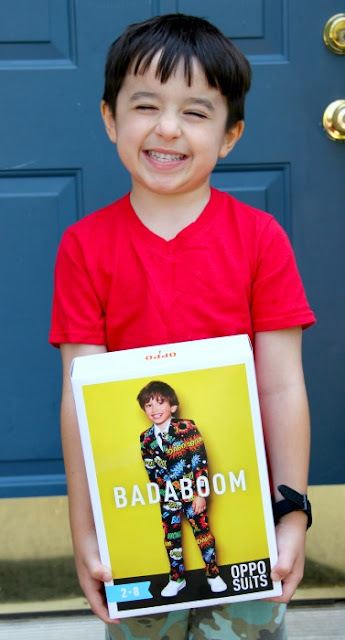 We had the greatest time showing off the Badaboom OppoSuit to friends and family and of course taking what has become some of my favorite blog photos ever! I"ll be framing at least one of these pictures and hanging it in his room as a simple reminder to him of the super hero living inside. This suit and any OppoSuit would make the perfect outfit for your upcoming photoshoot! If you love this Badaboom suit as much as we do, click HERE to order yours today for $64.99! OppoSuits has made us jump up and cheer! Not just for young boys, OppoSuits has attire for teens, adults, both men and women. Click HERE to check out the variety of styles available through OppoSuit! Follow OppoSuits on their social media page to hear about new styles, promotions, and share pictures! One lucky reader will win their own boys OppoSuit! To enter, just use the Giveaway Tools form below. Giveaway open to United States, ages 18 and up. Ends 9/7/17 at 11:59PM EST. My nephew would look do handsome in the RED DEVIL suit. I love the Badaboom suit because my boys are really into comics, and it’s so fun and bright! The Red Devil is super cute too! The Badaboom is definitely my favorite because it's bold and colorful and fun. I really like the nostalgic PAC MAN suit! I really love the boys Red Devil, and boys Badaboom suit! Any of my boys would be thrilled to wear any of these! They are so unique and fabulous! I LOVE the Red Devil! Maybe this is a bit too cheesy, but my nephew is a red head and I think he would look ADORABLE in it. I like the TEEN BOYS Badaboom because my kids love comics. I love the TEEN BOYS RED DEVIL suit. It would be great for Christmas. I think he'd look fly in the Boys Red Devil suit. I like the Boys The Lumberjack!These are just so darn cute!